63″ discharge height, 9” reach. Discharges containers of frozen chicken strips, popcorn chicken, or chicken nuggets. Containers loaded via powered walkie stacker at 8” above floor level. Sanitary tubular 304 stainless steel construction with continuous TIG welds. Dump carriage features round pipe bottom and openings to allow debris to fall through. No penetrations made into structural tubing, welded stand offs allow easy cleaning. 304-2b stainless steel product contact surfaces with welds ground smooth. Stainless steel hydraulic fittings, tubing, conduit, and braided hydraulic hose. Stainless steel machine guarding with through beam sensors on load side. A/B MicroLogix 1100 PLC with color PanelView Plus 600 color operator interface. 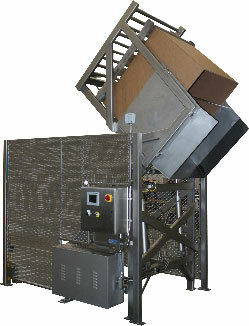 2 HP wash-down duty, paint free, stainless steel motor. 2 GPM fully self-contained hydraulic system housed in a stainless steel enclosure.